Posted February 3rd, 2011 at 1:21 pm. For the second year in a row, a graduate of Bryn Mawr’s department of classical and Near Eastern archaeology has won the Archaeological Institute of America’s Gold Medal Award for Distinguished Archaeological Achievement, the organization’s highest honor. Susan Irene Rotroff ’68 was awarded the medal at the Institute’s annual meeting in January. Rotroff is the eighth Bryn Mawr graduate to win this laurel. Two other winners of the award were Bryn Mawr professors; thus Bryn Mawr-affiliated archaeologists make up about a fifth of the winners of the AIA Gold Medal (see a list of other Gold Medal winners from Bryn Mawr below). Rotroff is the Jarvis Thurston and Mona Van Duyn Professor in the Humanities at Washington University in St. Louis, where she teaches courses in both the department of classics and the department of art history and archaeology. Recognized as a top authority on Hellenistic pottery, Rotroff has been a leader in using the material culture of ancient societies to understand the daily lives of their people. She has published multiple volumes on pottery found at the Athenian Agora, a site to which she has returned throughout her career; she has also published on sites in Turkey and other areas of Greece. She was awarded a MacArthur “genius” fellowship in 1988. “Susan Irene Rotroff epitomizes all that professional archaeologists should aspire to: inspired teaching, extensive fieldwork, and an international reputation as a scholar,” says the AIA’s award citation. As a Princeton graduate student, Rotroff was given a thorough introduction to the archaeology of the period by Dorothy Burr Thompson, a fellow Bryn Mawr graduate (and fellow winner of the AIA Gold Medal). She served as Thompson’s research assistant. Rotroff ultimately co-authored a book on Hellenistic pottery and terracottas with Dorothy Burr Thompson and her husband, Homer Thompson. Her professional activity ensures frequent contact with the Bryn Mawr Department of Classical and Near Eastern Archaeology, Rotroff says. 1966 – Hetty Goldman, A.B. 1903, was the leading female archaeologist in Greece and Turkey in the early 20th century. She was the first female professor in the school of historical studies at the Institute for Advanced Study in Princeton. 1969 – Rhys Carpenter established classical and Near Eastern Architecture as an independent department at Bryn Mawr in 1914. Famous among both archaeologists and art historians for his work on Greek sculpture, he directed the American School of Classical Studies in Athens and founded its journal, Hesperia. 1977 – Lucy Shoe Meritt, ’27, Ph.D. ’35, did pathbreaking work on the study of architectural moldings on Greek, Roman and Etruscan buildings. Her careful classification of these theretofore-neglected architectural details was invaluable in establishing dates for many buildings and revealing the ways architectural motifs are transmitted from one place to another. 1987 – Dorothy Burr Thompson, ’23, Ph.D. ’31, did groundbreaking work on ancient terracotta figurines and was the first female Fellow of the Athenian Agora excavations. In 1936, she discovered the garden of the Temple of Hephaistos and became an expert on garden lore not only of early Greece but of Babylon, Egypt and Italy as well. 1988 – Brunilde Sismondo Ridgway, Ph.D. ’58, was a disciple of Rhys Carpenter who transformed the study of Hellenistic sculpture by focusing on original works rather than a combination of textual sources and Roman copies, an approach that had resulted in many erroneous attributions and dates; as a corollary, she pioneered the study of Roman copies as art objects in their own right. 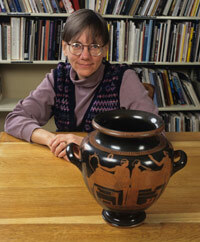 She served as the editor of The American Journal of Archaeology. 1989 – Virginia R. Grace, ’22, Ph.D. ’34, vastly increased the understanding of economic exchange in the ancient world through her study of ceramic transport vessels. 1991 – Machteld Mellink joined Bryn Mawr’s faculty in 1949. She was cited by the AIA as “‘Dean’ of American excavators in Turkey, preeminent scholar of Anatolian cultures, tireless defender of ‘the Record of the Past’ and of ethics in archaeology.” She served as president of the AIA between 1980 and 1984. 2006 – Maria Coutroubaki Shaw, Ph.D. ’67, and her husband, Joseph Shaw, led the important excavations at Kommos, on the south coast of Crete, where they found a Minoan town that was a major emporium for trade between the Aegean and other cultures from Sardinia to Egypt, and an Iron Age sanctuary that was a link between the Phoenician and Greek cultures.